I'm racing to get ahead of the schedule for this spring so that I can find studio time and blogging time. Unfortunately, neither happened over the holidays, although I had plenty of quality time with family and friends. 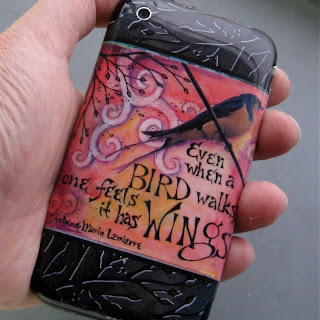 One rare fun moment of creation involved creating an iPhone skin for my dear friend Lora Hart, who was so flattering as to ask for one with my artwork on it. This pink should set off her delicious red hair. Coming soon, I hope, the skin I ordered for my new, surprise iPad. Yes, if you are wondering, I love the thing, although I don't have it doing everything I desire yet. Still, it's an amazing device to me. I would love to know how you were able to make the iskin? do you upload the image to a site and they screen it? Lindamay -- I uploaded my original artwork to skinit.com. Easy, but not as inexpensive as I'd like. What I'd really like would be to have a collection of my skins to offer for sale, so that I could make a few dollars off my work. That I haven't figured out yet. Anyone? Well, I wouldn't sell the ones we have. I want us to be one-of-a-kind. But I have plenty more drawings to use. I think your "skins" would be very popular. I know I want one! So I'll be following your posts to be one of the first maybe for my Kindle? !